Integrate Batch push notifications in your Dynamic Journeys. Successful demand generation, email marketing, and lead management engagement hinge on a modern solution and strategy aligned to buyer needs across all phases and channels of the buying process—Oracle Eloqua marketing automation. The platform allows marketers to build dynamic cross-channel campaigns, score leads, identify campaign engagement and conversion behaviour with a thorough set of analytics tool. Why should you connect Oracle Eloqua? 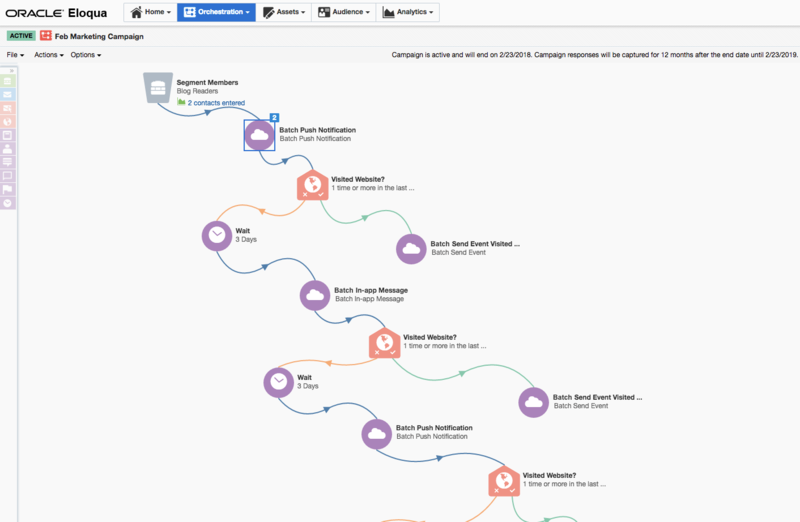 Thanks to this connector, you can directly add Batch push notifications campaign to your Eloqua automation scenarios. Ensure the success of your CRM strategy on Eloqua leveraging all available medium to create comprehensive multichannel campaigns. Batch will forward to Eloqua the user optin attribute for reachability purposes. Notification reaction data will also be available in Eloqua’s Journeys for your campaign automation needs.